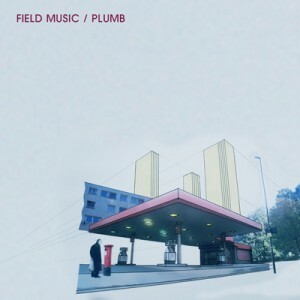 Plumb, the fourth full-length from brotherly duo Field Music, sounds like one of their liveliest releases for two reasons. One is its clear and playful homage to traditional British rock greats like XTC, Pink Floyd, and even Queen. Tracks like “Sorry Again, Mate” and “Guillotine” reap benefits from the influence, which for the Sunderland-based group is to be expected. The other is typical of every Field Music release, that being its breathless progression. Tracks flow into each other without a pause; large chunks of the album would sound like one song if not for the ceaseless variation, both in rhythmic tempo and alternations between lively prog-rock, psych-pop, and orchestral-laden chamber-pop. Without noticing the track listing, it would be easy to mistaken the fifteen tracks for thirty or perhaps forty separate entities. There’s just that much content here, the majority of it quality. Grandiosity is apparent from the very beginning. Opener “Start the Day Right” is complete with a twinkling orchestra. Disney-time strings serve as a precursor to prog-rock fireworks, which boisterously erupt in the form of swift guitar arpeggios and the group’s renowned rhythm section. Field Music have always crafted approachable and tight pop songs on a singular level, but the production on their albums make it sound restless for a reason. Plumb is a continuation of that. Rarely does a song meander in one place too long. Stylistic twists and turns are always around the corner, whether it’s creepy psych-rock (“Guillotine”) or lavish orchestral interludes (“Ce Soir”) lurking there. “It’s OK to Change”, apart from showing off the band’s consistently excellent rhythmic chops, is an apt separator between “Start the Day” and “Sorry Again, Mate”, both grandiose and high-scaling songs in their own right, but with distinguishable difference. “Sorry Again, Mate” is a stunning Queen/XTC hybrid that matches operatic pop with intricate prog-rock. The chorus and bridge arrive after a gentle piano lead and guitar trickle, injecting an arsenal of strings and booming kicks and snares. “Can I afford another day on my own? / Sat in the kitchen with the radio on,” Brewis sings during the song’s peak. It’s a majestic track serving as one of Field Music’s best. The bubbly “Choosing Sides” plays like an oddball Todd Rundgren recording, like one of his squeaky synth experiments on the ’73 classic A Wizard, a True Star. The synth minimalism subtly expands into moody psych-rock, more in the vein of ELO, before reverting to their squeaky-clean indie-rock arsenal. Apart from the intro, the song’s most interesting component is the delivery of its chorus. Here, the Brewis brothers assume Kevin Barnes’ tendency of nodding to psych-pop through overlapping pop harmonies of varying pitches. It’s an interesting and somewhat new approach for the band, but provides seamless results as expected. When you specialize in a schizophrenic vein of prog-rock, it’s no big deal. On the other end, “A Prelude to Pilgrim Street” works like clockwork, literally. An actual tick-tocking comprises the initial rhythm as Brewis lifts his airy vocals over piano and echoing bass. It sounds quintessentially English, like something Paul Weller or McCartney would put out in the ‘90s, with the colorful pop of XTC thrown in for good measure. Then there’s “Guillotine”, which sounds like Syd Barrett in more than just the title alone. An ominous feel is brilliantly captured through sliding guitar twangs and key-laden atmosphere. Field Music have never been hesitant to trace back to classic British rock, and Plumb is the most eclectic example of that. “Who’ll Pay the Bills” has a nice refreshing chorus, but doesn’t offer much else to anticipate. The verse’s jangle is almost painfully straightforward, but its place as a breather after “A Prelude” and “Guillotine” is wise. Simplicity is sometimes an example of sequential brilliance, and this is one of those instances. The ominous feel of the latter returns quickly, though, with the brooding “So Long Then”. The intro is somewhat deceiving, as is its return after the first verse. But the main pop appeal isn’t hard to find, like most Field Music tracks. A playfully awkward piano flows to graceful places, even touching the Old West in its arrangement. “Just Like Everyone Else” is a stripped-down, bass -led track that sounds like (very) early Field Music material, when orchestras were relatively absent. The emotive sound of stringy guitars and pulsating bass brings to mind the days of Manic Street Preachers when Richey Edwards was still around. It’s a simple yet resoundingly effective song, a mellow traveler that does well to lead into the boisterously upbeat closer “(I Keep Thinking About) A New Thing”. Field Music have not released a bad or even middling album yet, and Plumb has no intention of stopping that run. While certain British homages are more evident, the band sounds more creative and invigorated than ever. Unlike many critically acclaimed British art-rock groups of the ‘00s, Field Music are getting better with age — both with their new releases, and when looking back at their spectacular previous three albums. There remains a timeless quality within their music, indebted to influence as well as stylistic cohesion; they grapple the best aspects of prog-rock and combine them tastefully with traditional British rock greats of the past. If there’s ever a time to celebrate this relatively overlooked group, it’s now. I love it. I couldn’t agree more with your last sentence, I’m celebrating them starting now. I’m going to jump on it and get these guys Youped. sounds great, especially “A New Thing.” The guitars sound unique and fit the song really well.